Around work I’m known for my baking—and at this time of year, it’s for my platters filled with 20-30 different types of holiday treats. I didn’t really realize this was such a feat until my friends and coworkers started commenting on it. To me, it’s just making cookies and candies. And really, with some preparation and organization, it’s something you can do too. If not 20-30 treats, you can apply the same process to a smaller number of recipes. There are certain “tried & true” treats that I always make, so I have those recipes. But, throughout the year, I’ll gather new recipes to consider in a Holiday Inspiration folder (the old fashioned kind, I’m not on Pinterest!). I find recipes in magazines like Cooking Light, Woman’s Day, Family Circle, etc. and online. Food Network has a fun seasonal newsletter “12 Days of Cookies” that you can sign up to receive. 2) Finalize recipes and create a spreadsheet. • Other items needed (non-staples that I don’t have like Marshmallow crème, candies, etc). I maintain a cookie spreadsheet year after year, so it’s easy to just add to it. When you’re first starting out, use the categories above to build yours! From the spreadsheet, I make a grocery list so I can buy some items each week as holiday baking items are/go on sale in the grocery stores. Buying 10+ lbs of butter is the norm! If I can make a plug, Aldi is a great store to buy some of the baking basics at the best prices! As staples like sugar and flour are on sale mid-late year, I stock up on those. Any I don’t use for holiday baking will be used up in the months after the holidays. I’m a person who always has a well-stocked pantry. In early November, I take a Saturday or Sunday to gather and measure the dry/miscellaneous ingredients for each recipe. 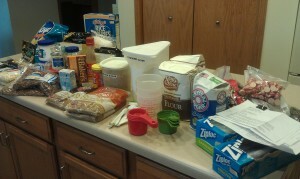 This is the part of baking that takes so much time and makes such a mess of your kitchen, so why not do it all at once? 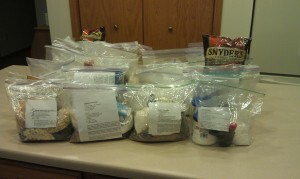 I put the ingredients for each recipe into a large Ziploc bag along with a copy of the recipe. On my spreadsheet, I have my baking scheduled for each day. I usually start in late November and I try to have everything done by mid-December so I can make platters as needed for parties, co-workers, family gatherings, etc. Lots of large rectangular Rubbermaid containers and a large freezer are a must (even a cold garage will work!). I usually bake/make 1 type on weeknights and 2-3 each day on the weekends. Keep in mind, I work full time and have a family! I check each morning to see what butter is needed for the recipe that day and I leave it out on the counter to come to room temp while I’m at work so it’s ready to go when I get home. Also key to my efficiency is my KitchenAid stand mixer, double oven, extra-large cookie sheets (each can hold 20-24 cookies! ), and my cookie scoop. It’s nice that my daughter will now help some since she’s gotten older. She likes to scoop dough. The tough part is then getting things frozen before my hubby can get into them! Out of sight, out of mind, right? The one type of cookie I actually don’t enjoy making is cut-outs! The pressure of rolling out dough to a uniform thickness and the hand decorating is just too much! That’s the reason that even the everyday task of making a home-cooked meal for my family is so important to me. I’m taking good care of my family by making quality, healthy (well, maybe go easy on the cookies!) food. Hopefully my daughter is learning good eating habits because of it! Stay tuned—I’ll share a picture of the finished product (platter) in mid-December when I bring cookies to share with my co-workers! Can’t wait to try them Melynn! sounds yummy. You are so organized! Each year, I use a piece of scrap paper to list the cookies I will make, the amount of butter, eggs, flour, etc. each one calls for, then total them up before I go shopping. Next year, a spreadsheet! And the gather and measure step is something I never would have thought of. What a great idea. Thank you.